We are all so excited about our resident corpse flower – she even got her own cupcake! – and we’re thrilled to see that Lois is all the rage on Twitter – and last night, intrepid Tweep Justin Concepcion (@JVConcep) started a trend – songs we should be playing for Lois. We don’t know if this will get her to finally open, or it’ll just be fun to rock out to – but here it is: our crowdsourced corpseflower playlist! Major thanks to Justin, who came up with the idea, collected the song titles, told us why they fit and sent us the list! Because we all want the funk!! Because this is the #1 most requested song choice! Because Lois is BUSTIN’ OUT!! Something we’ll all be saying the second we enter the building…Oh my god…. Because @tweetJbtweet really really wanted it and even visited @corpzflowrlois super late just to tell her personally! Because @snakecharmers hearts this song like nobody’s bidness! Because @meghanchall is going to teach you lamaz and hopes this song’ll do it! Special thanks to all the great tweeters who shared song choices!! PLEASE NOTE: Some of the lyrics for some of the songs on this list are not family-friendly. C’mon Lois! You can’t rock like that! UPDATE: As Lois continues to defy expectations (read: she’s getting ready to bloom – but moving very, very slowly) her playlist continues to grow! Justin (@JVConcep) – the brains behind the development of this playlist for Lois – got these extra submissions via Twitter and wanted to share! Title says it all. Requested by @MaryBenton, and we all know there’s something about Mary… She’s a…She’s a… reporter from channel 2 and I’m NOT looking to get defriended by her! Still waiting on @isiahcarey @miyashay and @alexsanz to submit their requests!! Someone send them a note! @stephsparkle says this is the song Zac would dedicate. You gotta love the hair (in the video at the link) and you know we all love Zac for tending to Lois! Suggested by @coconutwireless. Lois is standing tall, not quite Yao Ming, but will she deliver?? Hmmmm! Because Lois has spirit and @ncibrooke and @mgengelbach are ready to smell it! Suggested by @allison326 because she wants to see Lois pop and lock and drop it like it’s hot while blooming. Because Lois is an ‘international kinda flower.’ She attracts all kinds of FUNK! No discrimination here! An updated photo for an updated playlist! of photos of her growth on Flickr. Does Zac plan on pollinating Lois? Hey make t-shirts that say, “I smell dead people @ HMNS”with a picture of a corpse flower. HAHAH Dead Skunk is my favorite, it is one of my Daddy’s favorite songs. 🙂 I am excited to see what she looks like today! Hurry and post some pictures! We do not plan to pollinate Lois, since that would cause the flower to close up right away – we want it to be open for as many people to see her as possible! Thanks for the heads up – I’m going to update the post to make sure everyone understands that the lyrics may not be kid-friendly! Am I the only one getting flashbacks to the “Little Shop of Horrors”? 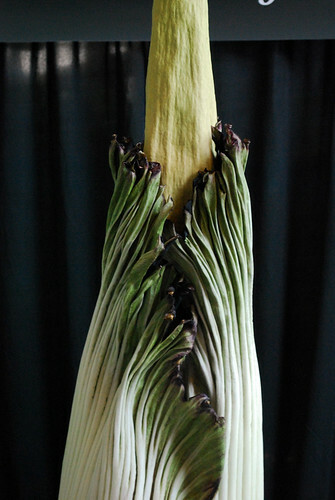 Has she bloomed already?…no more updates. I know the smell can last 8-12 hrs, but does the smell only come out once it is fully open? And how long does the opening process/blooming take? 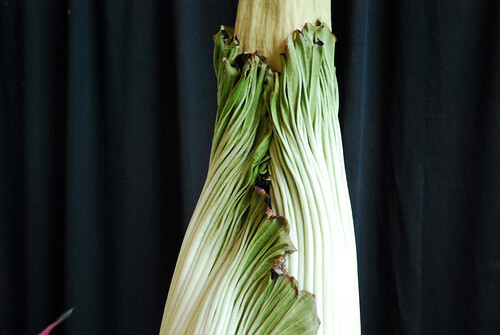 Form what we understand from other botanical gardens that have had a corpse flower bloom, the smell begins as soon as the flower starts to open up and lasts for 8 – 12 hours. The open process takes 4 – 6 hours. What? No “Love Stinks”? It could be sung as Lois Stinks! Okay, I am going insane here!!!! I am hoping she bloomed over night. I am waiting for the updates on the stanky thang. You know, I looked up with the scientific name meant… and WOW… poor whales… haha! Tonight’s The Night by Rod Stewart might be appropriate!